There’s something freeing about getting behind the wheel of a lightweight roadster and venturing to the open road, with the ability to focus more on the journey than the destination. 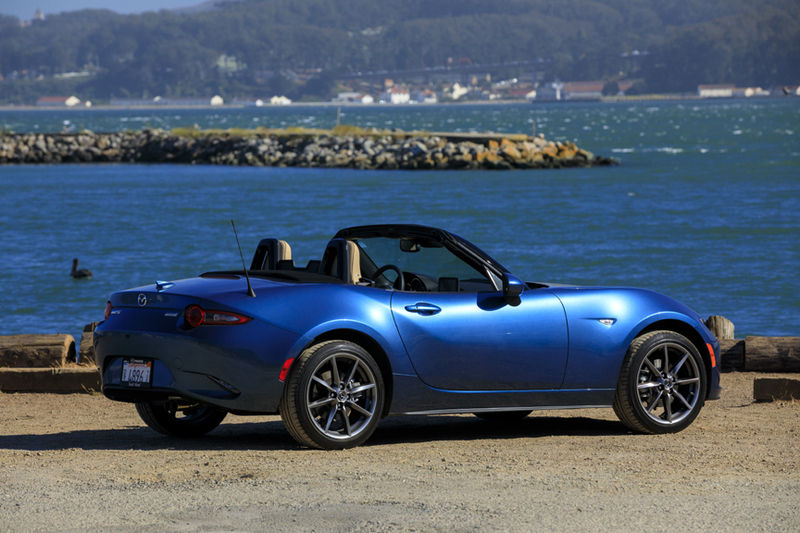 It is for those drivers that Mazda has spent nearly 30 years perfecting its flagship roadster, the MX-5 Miata. The MX-5 has brought joy to millions of drivers across the world, and now it has been perfected with SKYACTIV-G 2.0-liter engine with a power increase of 26 horsepower and 3 lb-ft of torque and an increased redline from 6,800 rpm to 7,500 rpm compared to last year’s model. So, how do you make the world's best-selling, two-seat roadster even better? 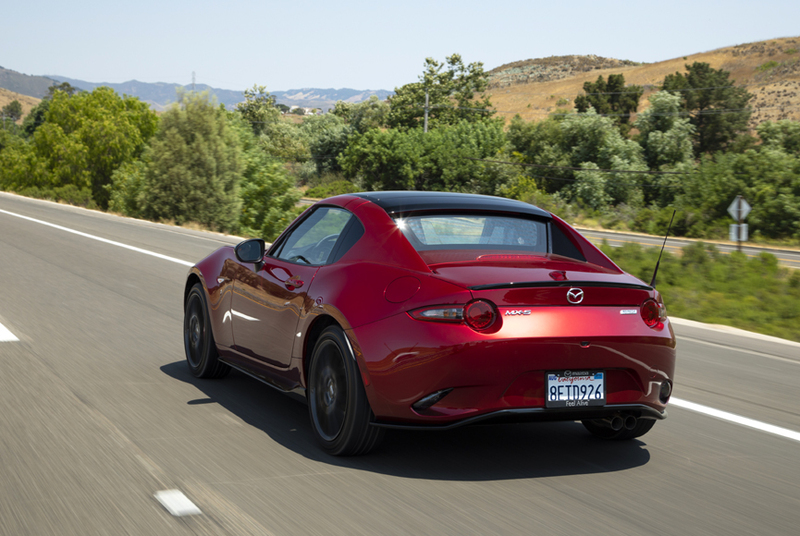 Mazda's designers and engineers have found the answer with the 2019 MX-5 Miata RF, which went on sale in August 2018. MX-5 Grand Touring comes equipped with 17-inch dark silver wheels; body-color interior trim; auto on/off headlights; an auto-dimming driver's side mirror; rain-sensing windshield wipers; automatic climate control; auto-dimming rearview mirror with HomeLink; heated, leather-trimmed seats; a 9-speaker BOSE Premium audio system; a fabric-lined soft top for greater sound insulation; Sirius XM Satellite radio with a 4-month trial subscription, Mazda Navigation; Blind Spot Monitoring with Rear Cross-Traffic Alert; new Traffic Sign Recognition; Adaptive Front-lighting System; High Beam Control; Lane-Departure Warning; and Smart City Brake Support. 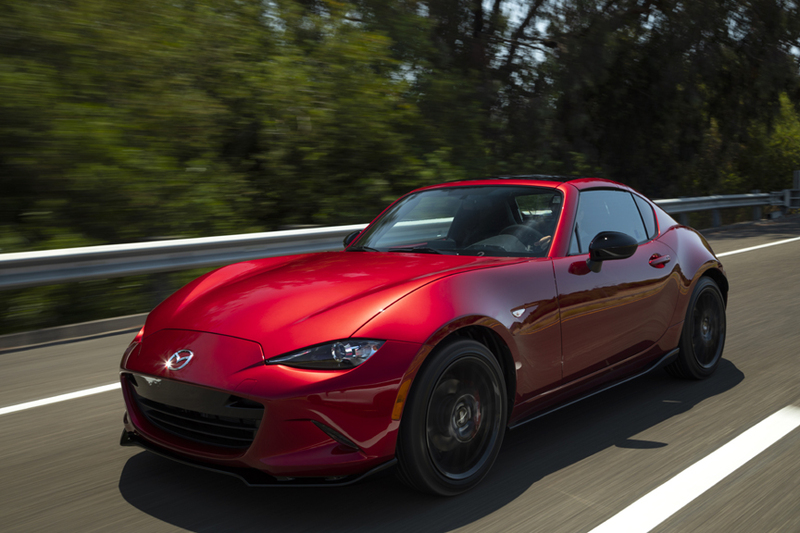 Listening to customers' demands, Mazda will offer a new GT-S Package for MX-5 Grand Touring models equipped with the SKYACTIV-MT 6-speed manual transmission, equipping those models with a front shock tower brace, limited-slip rear differential and Bilstein dampers. MX-5 RF models with the GT-S Package will also come equipped with the hand-painted black roof that had previously only been offered in the U.S. on the 2017 MX-5 RF Launch Edition. MX-5 Club models continue the two-pronged, higher-trim strategy, offering a harder-edged foil to the MX-5 Grand Touring. MX-5 Club comes with standard Bilstein dampers, shock tower brace and limited-slip rear differential in models equipped with the SKYACTIV-MT transmission. All other MX-5 Club models receive standard heated cloth seats with red contrast stitching, body-color interior trim; Metallic Black alloy 17-inch wheels, front air dam and rear lip spoilers, a 9-speaker BOSE Premium audio system, SiriusXM Satellite Radio with a 4-month trial subscription and Blind Spot Monitoring with Rear Cross-Traffic Alert. Additionally, MX-5 Club SKYACTIV-MT can be had with the Brembo/BBS Package and Brembo/BBS/Recaro Package. The Brembo/BBS Package include front Brembo rotors and calipers; red-painted brake calipers on all four corners; 17-inch, dark gunmetal BBS forged alloy wheels; functional side sill extensions; a rear bumper skirt; and heated leather-upholstered seats. The Brembo/BBS/Recaro Package is new for MX-5 RF and replaces the leather-trimmed seats with heated Recaro buckets. It also includes a black-painted roof. All 2019 MX-5s come standard in the U.S. with a SKYACTIV-G 2.0-liter engine, producing 181 horsepower at 7,000 rpm and 151 lb-ft of torque at 4,000 rpm. That represents an increase of 26 horsepower and 3 lb-ft of torque over the previous model. Thanks to a host of internal improvements, including lighter pistons and rods and a larger throttle, MX-5's engine produces more torque throughout its rev range and enjoys a 700 rpm higher redline for the new model year. The new engine comes paired to either a standard SKYACTIV-MT 6-speed manual transmission or an available 6-speed automatic transmission with paddle shifters and Sport mode. The 2019 MX-5 RF goes on sale nationwide this August. MX-5 soft top pricing, packaging and on-sale timing will be announced at a later date. 1 Manufacturer's suggested retail price does not include $895 for destination and handling ($940 in Alaska), taxes, title or additional fees. Dealers set actual sale prices.